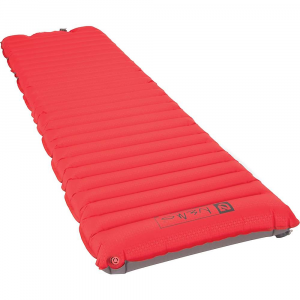 The Big Agnes Insulated Air Core Ultra is a comfortable, well-made mattress that has a number of unique features. Those features and price make it a good choice for the value conscience backpacker looking for a high quality and reasonably light mattress that will give them many seasons of use. When I was young it seemed that I could sleep anywhere on just a thin ensolite pad and still get a good night's sleep, but as I have grown older the pads have changed to air mattresses and while they were initially around only an inch thick they are now around three inches thick and I can’t see ever going back to anything thinner. 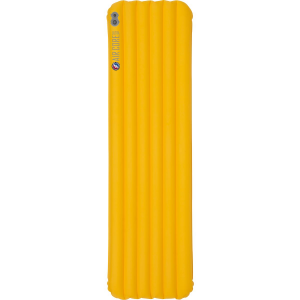 For the last several years I have been using a 25 x 72 Big Agnes Insulated Air Core and have very much enjoyed the mattress and have never had any issues with it on the trips I have used it on. The opportunity came up here at Trailspace to review the latest version of this mattress now called the Insulated Air Core Ultra, so given my experience with the previous version I really wanted to see how the design has evolved and improved over the previous design. The BA Insulated Air Core Ultra is positioned as BA’s economical mattress that offers several improvements over its predecessor in being easier to inflate and deflate, lighter weight, more packable, and manufactured with tougher materials. 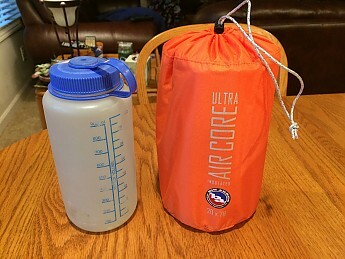 While I will get into a more detailed review below, overall the Insulated Air Core Ultra is a design that does offer notable improvements in each of the areas stated by Big Agnes when compared to the earlier design. 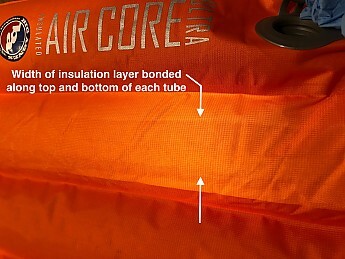 For this review I will be reviewing the 20 x 78 inch version of the Insulated Air Core Ultra. I have included the video below that was created by BA and provides an overview of this mattress. Within the package the mattress comes in you get the mattress, a stuff sack that includes a cord lock, and a repair kit. Here is a detailed view of the repair kit that is included. 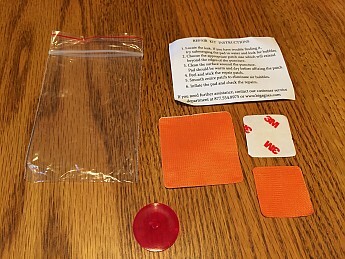 It contains a single larger 2 x 2 inch patch, two 1-1/4 x 1-1/4 inch patches, a set of instructions for applying the patches and a spare diaphragm for the inflation valve. It’s nice to see that BA used quality materials from 3M for their patches. From a packed size and weight perspective, the BA Insulated Air Core Ultra is comparable to other mattresses in this price range. Here is a picture of the packaged mattress next to a typical one-liter water bottle. 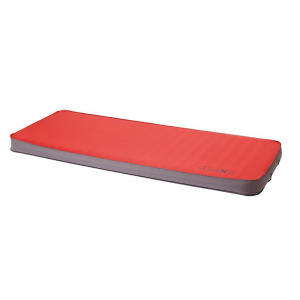 The Insulated Air Core Ultra is advertized as being a lightweight mattress with an advertized weight of 23 ounces for the 20 x 78 inch mattress. When I weighed the complete package of the mattress, stuff sack and the repair kit I found the weight to be 22.0 ounces. When I weighed the mattress alone I found the weight to be 21.2 ounces. The advertized size for the Insulated Air Core Ultra I am reviewing is 20 inches wide by 78 inches long for an inflated mattress. Just for completeness I thought I would include the dimensions of the un-inflated mattress, which are 25.75 inches wide and 79.25 inches long. 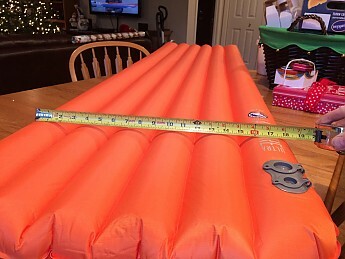 When I inflated the mattress I found the dimensions to the outer edges of the mattress to be 20.50 inches wide by 78.50 inches long, which is in agreement with what is advertized by BA for this model of the Insulated Air Core Ultra. The one thing that I have found when considering the size of an inflated mattress is that the actual useable area can sometimes be less then the advertized size. When a mattress has design features like the tubes that make up the Insulated Air Core Ultra, the radius on the outer edge of the tubes around the perimeter of the mattress really are not that useful in providing support, especially when the mattress is inflated at a higher pressure. The photo below helps demonstrate this point. When you measure across the crest of the tubes on the mattress you find that this dimension is only about 18.0 inches compared to the 20.0 inch overall width. The same holds true along the length of the mattress as the length along the top of the tubes is about 75.50 inches before it rolls off to the 78.0 inch overall length. 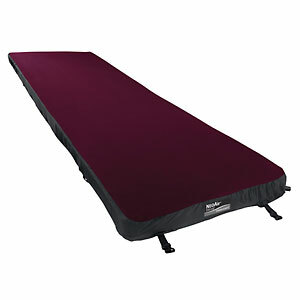 Like I stated earlier, I currently own a 25 x 72 BA Insulated Air Core that I really like, but with my height being 5' 11" the effective length of this mattress is more like 70 inches, so I always have a hard time keeping a pillow under my head without having to dangle my feet off the end of the mattress. It’s not a fault of the mattress in any way, but it is something to consider when you’re selecting a mattress to make sure it will provide the amount of support you are looking for. Now that I have used this 20 x 78 inch Insulated Air Core Ultra for the last couple of months, I find I really like the longer length and I would recommend this length mattress to anyone close to or taller than six feet. Before I get into the details of the Insulated Air Core Ultra design, I wanted to comment on how comfortable the mattress is to sleep on since this is the primary reason for buying a mattress. As I mentioned earlier, I have been using an earlier version of this design for a number of years and have always found it very comfortable. While my old mattress size was a 25 x 72 and the mattress I am reviewing is a 20 x 78, I found this mattress to be just as comfortable as my old mattress. So from a sleeping perspective I am a very happy camper sleeping on this mattress. In general, I have always found that products from Big Agnes are well designed and are of good quality. The Insulated Air Core Ultra is no different and my overall impression is that the design is well thought out and the build quality is very good. I’ll try and touch on each of these areas of improvement below. The Insulated Air Core Ultra overall design is a basic tube style of construction that is comprised of six tubes total and where the two outer most tubes are larger in diameter then the four inner tubes. I measured the outer tubes and found them to be approximately 3.5 inches in diameter and the inner tubes I found to be about 3.00 inches in diameter. In use, I did find that the larger diameter outer tubes were effective in helping me stay on the mattress through the night. One important feature to point out with the Insulated Air Core Ultra is that by using an equal number of tubes in the design of the mattress, your backbone will always rest in a groove between two tubes, which I find more comfortable. When a mattress is designed with an odd number of tubes your backbone always rests on the crest of the tube in the center of the mattress which can be uncomfortable and cause you to sleep more to the left or right or to drop the pressure in the mattress to a value lower then what you would normally like. One of the advertized features of the Insulated Air Core Ultra is that it is made from more durable lightweight nylon rip-stop fabric that has a thermoplastic polyurethane (TPU) material laminated to the rip-stop to provide for ultimate durability. The double rip-stop fabric being used is supposed to have 25% greater tear strength and durability. I didn’t do any physical tests to try and verify these claims, but from a subjective perspective the material does feel robust and appropriate for this application. 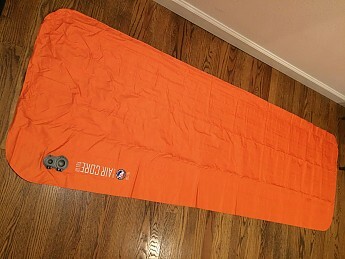 In actual use I try and avoid subjecting my mattresses to things that could cause damage by keep my tent or ground cloth clean, so I think anyone exercising a reasonable amount of care will find this mattress more than robust for backcountry use. In use, I didn’t find that the material was noisy in any way and no different from that perspective to my older Insulated Air Core. I do think this material is slightly more slippery then what was used with my Insulated Air Core, but I didn’t find it an issue during use in contributing to sliding off the mattress during the night. When I have had problems sliding off a mattress at night it has usually been because I ended up selecting a campsite on a slope. 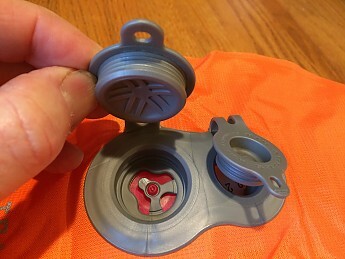 The Insulated Air Core Ultra incorporates a new valve assembly that has both an inflation and deflation valve and is a significantly different approach then the older style valve that is on my BA Insulated Air Core which has a single valve you unscrew to open and screw it down to close. 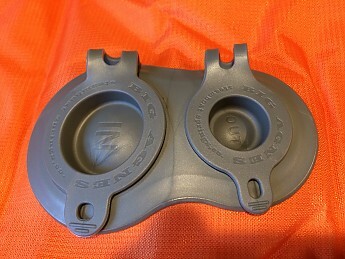 With the new valve assembly, each of the two ports contains an attached rubber plug that is removed to open the port and reinserted to close the port. The two plugs are labeled “in” and “out” and are different diameters. 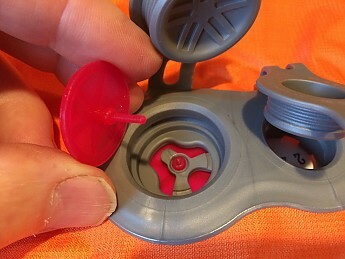 As shown in the picture below, each of the plugs has a number of ribs that run around the circumference of the plug that act as the seal when the plug is inserted into its mating pocket. The rib at the end of each plug is larger then the rest and there is a mating groove in the pocket that helps keep the plug secure in addition to being a seal to keep air in the mattress. While I haven’t had any issues with either of the plugs leaking air, I am not totally comfortable just yet with this design approach. With the valve on my old mattress if there was any indication of air leaking out you could just tighten down the valve that much more to hopefully seal it. With the approach being taken in the Insulated Air Core Ultra, if one of the plugs leak there really isn’t much you can do about it. Also, since this design has two plugs you now have two potential leak sources instead of one when you compare this design to other mattress designs that only have a single plug or valve. The “in” port and the “out” port of the valve assembly are different from a couple of perspectives. The out port of the valve assembly is just a plug and a hole, and it’s only intended to be used to deflate the mattress. After using this mattress for awhile now I can honestly say that the out port combined with some internal mattress design features I’ll get into later make this hands down the easiest and quickest mattress I have ever owned to deflate and get rolled back into a very small packed size. The in port of the valve assembly is used to inflate the mattress and is also used to do fine adjustments of the internal pressure for comfort. The in port has a small flexible feature to which a diaphragm is attached that acts as a one way valve when filling the mattress with air. In my experience with using the mattress the one-way valve worked well and never leaked any air while I was filling the mattress. The in port is also designed to accept the Pumphouse Ultra sleeping pad pump available from BA. 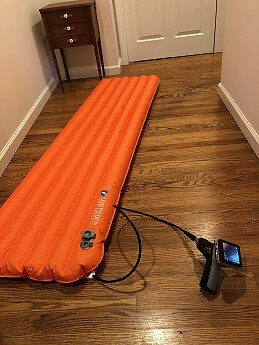 I have not had a chance to use the Pumphouse Ultra to know how well it works, but it looks like an interesting option for people who don’t want to blow up their mattress after a long day hiking. The use of the pressure adjustment feature is very simple. 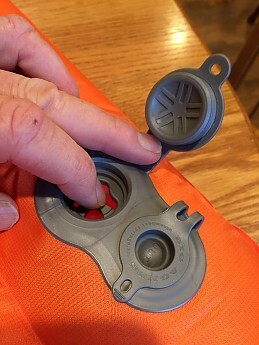 You first remove the in plug from the port which exposes the diaphragm feature, but does not allow air to escape, and then you gently take your finger like is shown in the picture below and press in the center of the diaphragm and let out air until the mattress is at the desired firmness. This feature works very well and it’s easy to just let out a very small amount of air or a lot. With respect to the diaphragm of the in port, I think it is great that BA included one in the repair kit but at the same time it makes me a little concerned that they included it for a reason. It's not the end of the world if the diaphragm were to fail as you only lose the one-way feature of the valve. The mattress could still be inflated its just that you would need to be a littler quicker installing the plug. If you like this feature and do bring along the spare diaphragm then it would be good to know how to replace it. Some final thoughts on the Insulated Air Core Ultra valve design. Wear — Unknown how the sealing capability of the plug and mating socket degrades with use due to wear. I have opened and closed these features about 50 times as I have been evaluating the mattress and have not observed any issues with the mattress holding air overnight. Temperature effects — Most materials become less compliant/stiffer at lower temperatures. The inflation and deflation valve sealing is directly dependant on the compliance of the elastomer being used for the plug and mating socket to create an air tight interference fit. I have used the mattress down to 26 degrees F and did not have any issues with the mattress leaking air or observe any noticeable change in the compliance of the plugs or sockets, so I think that BA did a good job with the material they selected for these components and I think they will perform fine for the intended three seasons that this mattress is advertized for. Maybe I’m too much of a worrywart, but given the thoughts above, I thought a useful addition to the repair kit would be a 4 x 4 section cut from a common surgical glove that could help seal the plug to socket interface if one of the plugs started to leak for some reason. If one of the plugs were leaking you would remove the plug, lay the 4 x 4 square of material over the socket and then reinstall the plug as shown in the picture below. There is one area where the Insulated Air Core Ultra didn’t live up to what I would have expected and this was with the insulation feature of the mattress. 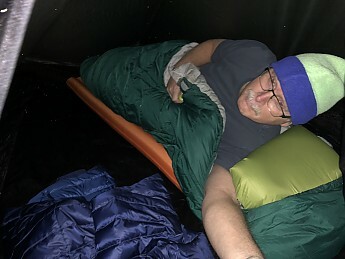 I have always had a good experience with my older Insulated Air Core from an insulation perspective in that when utilizing a down sleeping bag, the older mattress seemed to be providing a beneficial level of insulation. I have tested the new Insulated Air Core Ultra down to 26 degrees F and it really didn’t seem to provide much benefit at all. BA advertizes that the insulation used in the Insulation Air Core Ultra is WRM HL. The WRM HL used in this mattress is a high loft synthetic insulation that I couldn’t find any specific information on to see how it compares to other synthetic insulations on the market today, but when you handle the deflated mattress you can feel that the insulation is physically present. BA does not provide an overall R rating on the expected level of insulation capability that could be compared to other mattress designs, which is unfortunate. It is nice to be able to compare features so that you can pick the right product for your personal use and the lack of an R rating leaves you in a void as all you know is that this is a three-season mattress and it has some amount of insulation in it. Because the insulation feature of this mattress is not well communicated by BA, I decided to dig a little deeper to see what is going on inside of the Insulated Air Core Ultra. The out port on the valve assembly used to deflate the mattress is just a simple opening that is reasonably large and actually large enough for me to insert a borescope to take a look at inside the mattress. I was able to inflate the mattress and then quickly open the out port and insert the probe from my borescope. With the probe inserted I quickly sealed around the probe using a tucked in surgical glove which enabled me to look around the inside of my Insulated Air Core Ultra, which I thought was pretty cool (I’m pretty easy to keep entertained). Utilizing the borescope provided significant insight into the design details of the insulation approach used with this mattress design. Before I get into what I learned, I will share a short video I made that if you view it first, my discussion below will make a lot more sense. The video is of one of the smaller diameter center tubes next to the larger diameter side tubes. One of the first things I noticed that is unrelated to the insulation is the nice large diameter holes that exist along the length of the web that separate each of the tubes of the mattress. These holes are a very nice feature as they save weight, but more importantly they really allow air to move freely within the mattress, which is key to enabling this mattress to deflate so easily and quickly. Another point worth noting is that the white coating you see on several of the surfaces inside the tube is the TPU coating I mention earlier in my review. Getting back to the insulation, it is very clear in the video that there is a strip of insulation bonded to both the top and bottom of each tube and that runs the length of each tube. What is interesting is that the width of these strips of insulation are only a little over a third of the overall width of the tube. This width might be effective in limiting the heat being conducted if the mattress was inflated to a very high pressure so that the mattress only contacted the ground and the person who was sleeping on the mattress at the very top and bottom of each tube. Since most people don’t inflate their mattress to that high of pressure, you end up with a large percentage of the area in contact with the ground and the person sleeping on the mattress not being insulated which results in the mattress not being much more effective than an uninsulated mattress. The other thing that you will notice in the video is that the insulation isn’t always bonded for its full width on the top surface of the tube. Once the insulation becomes separated from the surface it is bonded to, cold air can now circulate along that surface and the insulation is no longer providing any benefit. To give you another perspective on the width of the insulation strips inside the mattress I have included the picture below where I have a light inside the tube and it allows you to see the strip of insulation bonded to the top of the tube. The list price of the regular long version of the insulated Air Core Ultra is $109.95. While this is not inexpensive, this is a very well made mattress, and BA is also known for standing behind their products and this mattress does go on sale at times and can be had for about $80. 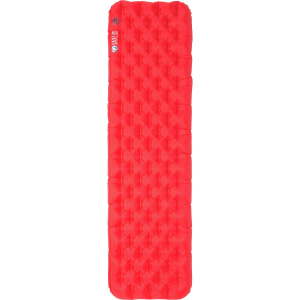 Overall I think the Big Agnes Insulated Air Core Ultra is a very well made comfortable mattress that has several nice design features that make it a great choice for the individual looking for an economical mattress that is also a solid design that will survive many seasons of normal use. 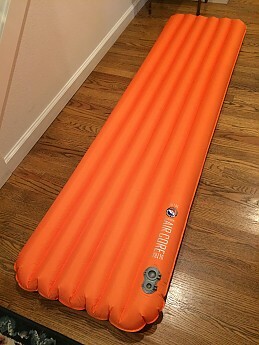 While I think highly of BA and the general Air Core Ultra design, I don’t think the Insulated version offers much improvement over the uninsulated version of this design and would recommend most people looking for a three-season mattress just purchase the Air Core Ultra and bring a supplemental pad like the Gossamer 1/8” Thinlight Foam Pad to use for those colder trips. 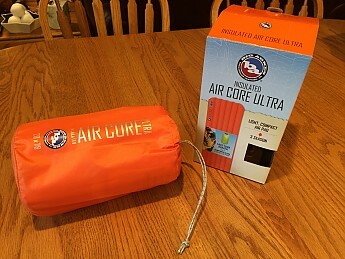 Many thanks to both Trailspace and Big Agnes for the opportunity to evaluate and test the BA Insulated Air Core Ultra for the Trailspace Gear Review Corps! Now that's truly a closeup look at a piece of gear, Mike! Nice use of your borescope, and great testing and review of this BA pad. Thank you! Just bought an REI FLASH Insulated air mattress (3 season version R3.7). Hi Eric (and I really like your TS nick name by the way), I would be interested in hearing how you like your REI Flash mattress as I am always on the look out for a good air mattress. Third time's the charm? Time will tell. If it stays inflated there won't be any cons, IMHO. I received this new model under warranty replacement. I had originally purchased one of the prior model that's a mute dark purple. It held air for about a week before it started to leak slowly. Within a few more days it would deflate in a matter of hours without laying on it. After doing leak testing and not finding the culprit I sent it to BA for repair and they promptly replaced it with a new one of the same. It was worse. Testing it at home it started slowly losing air the second day until it was unusable by the third. Mortified, I put it in storage and this was seven years ago in 2011. Cut and fast-forward to 2018 and as I'm going through excess stuff I come across it. I called CS at BA and now find they have this new model replacing the flop. Explaining the sequence to the CS rep, he sends me the warranty replacement form and requiring me to attach a pic of the old mattress with claim number written in marker near the BA company logo. No sending it in; just fill out the form and attach the picture to the form, voila! One week later I received the new Insulated Air Core Ultra. Kudos to impeccable warranty service. Now only time will tell, but it's holding air at home. No R value is stated by BA, only a 15 degree temp, but in comparing its specs to similar pads, most have an R value of 4-5. In temps of 35 degrees or below I find that using a foam pad beneath the inflatable makes a big difference in warmth and all so necessary if the pad deflates. Replacement pad developed a leak after two nights; this tiny leak detected at fabric-plastic joint at old style brass valve. Just call cs and you'll be sent the form to fill out and the instructions for the picture. You'll have the new one inside of a week. The whole lot of the purple/brown Q-Core were defective junk. I don't throw away anything with a lifetime warranty, but I'm certain that many were trashed. Does not seem as heavy material as original Q-Core. 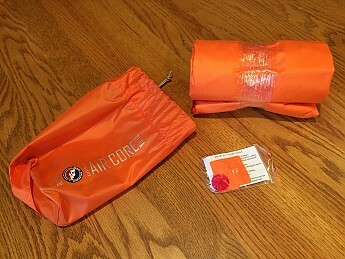 I had the older model Q-Core and while it took a bit to inflate, it was a very nice sleeping platform and served me well until leaks started for some reason. 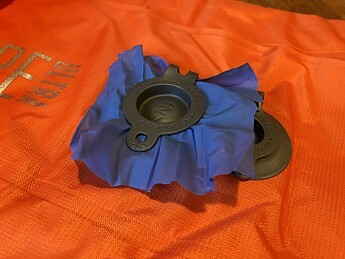 The first product was returned to REI after a failure of the valve that occurred during a fire camp in Washington state. It made some tough sleeping for the two weeks on that wildland fire. I deploy several times a year and sleep is pretty important after working 15 hours straight. I repaired one leak, but no matter what I did, it would not hold air all night, and I think the pad was delaminating. REI mentioned the same thing. I lost confidence in using it so I purchased the newer model. This newer bright orange pad sure inflates easy and has worked so far. It does move around a little on a cot. On the tent floor it does fine. The one concern is the material just seems so much lighter (good for backpacking), but will evaluate more this season. 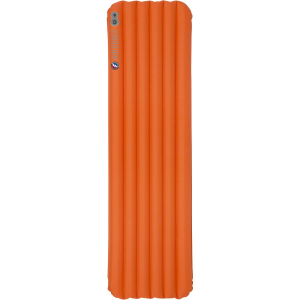 Experience with sleeping pads is about 4 years of service if used a lot. Thanks for the review, Jeff! Do you have any pictures of your BA pad you could show others in your review?